The time has perhaps come to make a significant change in my life. 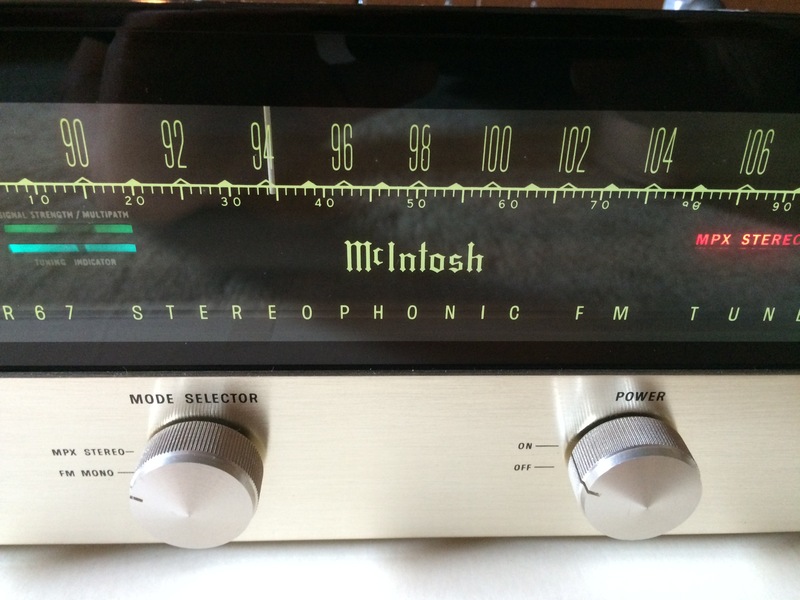 This week, I put my beloved McIntosh MR-67 FM stereophonic tuner up for sale on E-bay. As with my vintage Apple II computer which I sold on E-Bay two months ago, parting with this piece of personal history will be difficult, but necessary at this stage of our lives as my wife and I attempt to simplify our existence…and create space in which to operate. I purchased my McIntosh tuner on December 17, 1963 almost exactly one year after completing my degree in electrical engineering at Stanford University and landing my first engineering position here, in Silicon Valley. I had moved back in with my parents in nearby San Mateo, California, while paying off student loans – which were modest compared to those of today. In 1963, there was a tidal wave of general excitement over the technological improvements being made to audio equipment – all of which contributed immensely to the pleasure of listening to music. Premium FM stations were springing-up across the nation featuring popular music of the day with a fidelity which seduced the public. In 1963, the latest, greatest thing happening was the technology which brought stereophonic sound to these stations. That Hi-Fi audio excitement and the stereo trend led me to purchase my McIntosh FM stereo tuner. Iconic audio companies with names like Fisher, Harman Kardon, H.H. Scott, and Marantz moved to the fore-front of the public’s attention – much like the example of Apple, today. Most of these companies had their heyday for a number of years and eventually lost public visibility once the Hi-Fi / Stereo wave of public enthusiasm dissipated and computers became the next, great thing. One audio company is a notably unique exception to this history. That company is McIntosh Laboratory, founded by Frank McIntosh in 1949 to design and sell quality audio gear. Today, “Mac” equipment is still at the fore-front of the audio world and represents the extreme “high-end” of the genre. 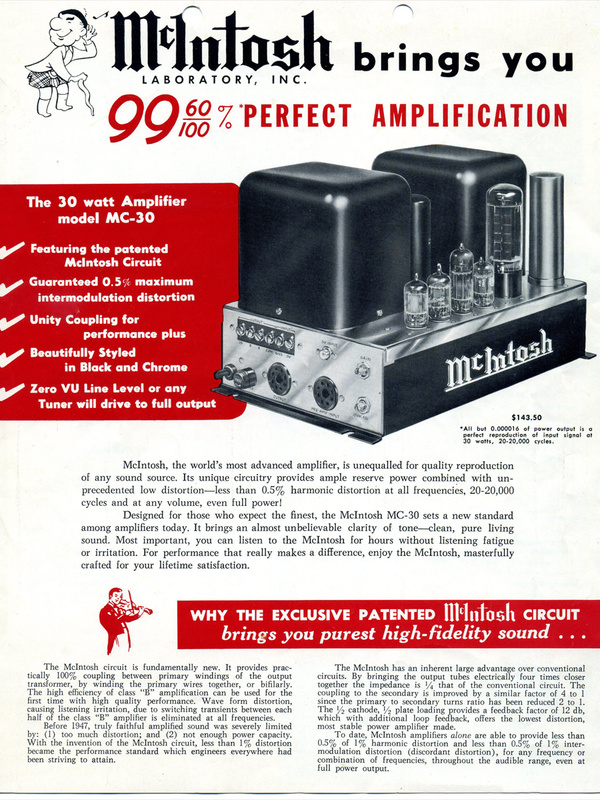 The 30 watt, monophonic power amplifier pictured in this early McIntosh ad sold for $143.50 – a lot in those days! It featured vacuum tube technology (no power transistors back in the fifties) and a McIntosh design innovation for the audio output transformers which drive the loudspeaker – an innovation which greatly improved the state-of-the-art. 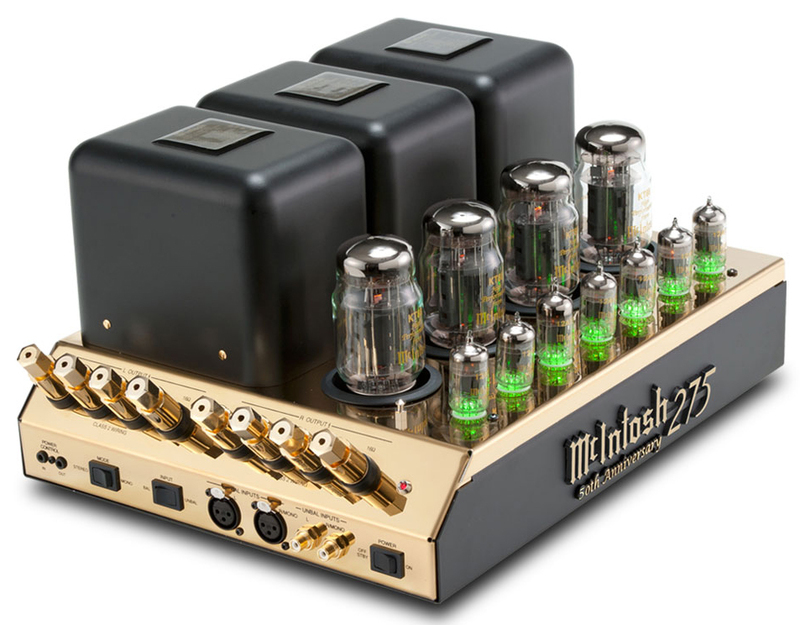 McIntosh recently offered a gold-plated 50th anniversary version of their bread-and-butter, two-channel, vacuum tube stereo amplifier, the venerable MC 275 (twin 75 watt channels). The price tag: a whopping $6,500! Clearly, McIntosh is not your usual company in any sense of the term. The name has long enjoyed iconic status, not merely for its eye-catching products, but for its dedication to well-engineered, quality audio equipment. It was that successful blend of attributes that attracted young fellows like me to the brand in the early nineteen-sixties. 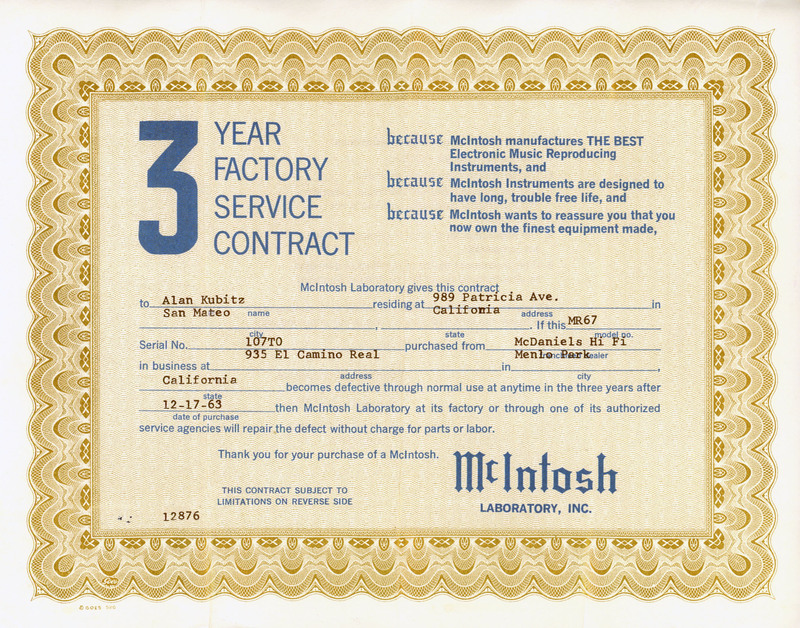 McIntosh was the ONLY audio company that published – in technical detail, on their individual marketing flyers – industry-leading performance specifications for each piece of equipment along with the guarantee that the purchaser would receive a full cash refund should the equipment fail to meet those specs. Pictured, here, is the 3 year McIntosh “warranty” for my MR-67 FM tuner. In 52 years of ownership and at least 35 years of total use, one light bulb needed replacing, and one “weak” tube also needed replacing (in 1987). Yes, I am a first-hand believer in Mac quality and reliability. My MR-67 tuner still works great! What about the situation, today? McIntosh represents the Rolls-Royce of audio equipment and is the granddaddy of the industry – one of the few survivors of that intoxicating period of Hi-Fi, vinyl LPs, turntables, amplifiers, tuners, FM stereo “multiplexing,” and so-on. McIntosh and other more affordable audio companies continue to cater to those for whom listening to music over IPod earbuds just doesn’t cut it. Technology continues its relentless march, and, now, I frequently enjoy casual listening to my Amazon Prime playlists via laptop or iPhone through the compact Bluetooth wireless speaker called the “UE Boom.” My brother-in-law, Ken, brought his “Boom” to a recent family event, and that was my introduction to a new listening experience. During the outdoor festivities, I kept wondering where the enjoyable music was coming from – I saw no speakers anywhere. I finally asked Ken, “Where is that great sound coming from, out here, in the backyard?” He then showed me the small, wireless, cylinder that is the “Boom” sitting unobtrusively in the middle of the patio table. That was good enough for me: I promptly bought one. The beauty of the scheme is that you have complete flexibility composing multiple playlists of favorite songs from various CD or streamed library files. With no single performer/group restrictions as imposed by a given CD album, the listening experience is truly a pleasure. More and more of my casual listening will be done this way; I may even check into an iPod, after all this time. 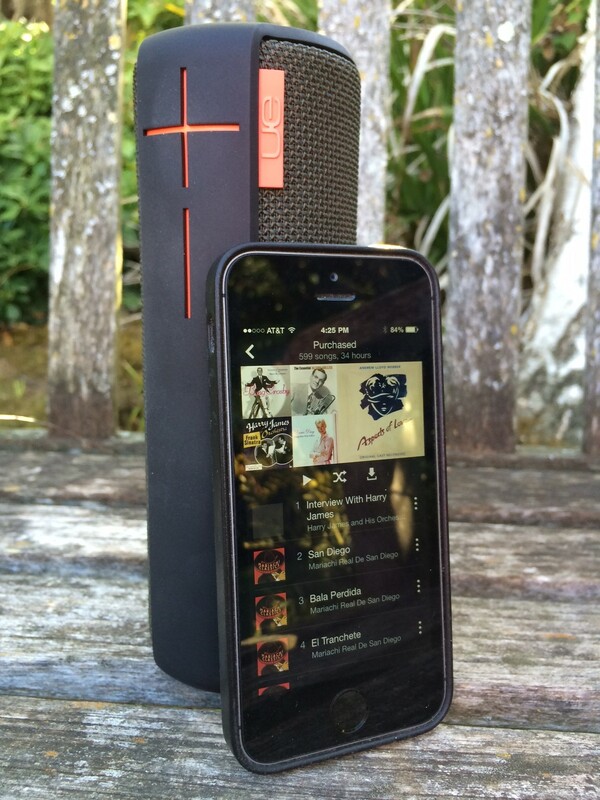 Two “Boom” speakers are easily paired to provide full stereo playback via Bluetooth. There is no getting around the fact that serious music demands serious listening time and good equipment. On those occasions, I retreat to my “modern” McIntosh system with its superb B&W pair of speakers. I have two CDs whose recorded music far surpasses any others I own. The first is a Philips recording of Tchaikovsky’s “The Nutcracker” as performed by the Kirov Orchestra – absolutely magnificent. The booming crescendo in the Pas-de-Deux can only be appreciated on a good sound system with fine bass capability. The other recording, a Telarc recording of Stravinsky’s “The Firebird” also deserves the best possible audio system – a truly amazing, ethereal CD, although perhaps not to everyone’s taste. These discs deserve dedicated listening time in front of a fine audio system. I like to hear them from a 200 watts-per-channel McIntosh MC 202 amplifier feeding my B&W Nautilus speaker pair: Pure joy! In popular music, audio technology, and listening modes, most everything has changed, but a few things have not. The McIntosh mystique in audio remains as strong as it ever was, although the affordability of its gear is now beyond most of us. The iconic, illuminated green/teal “McIntosh” logo behind the ubiquitous, proprietary black glass panel is alive and well. I am thankful that I bought my Mac system components before retirement – when I could (at least) barely afford them. 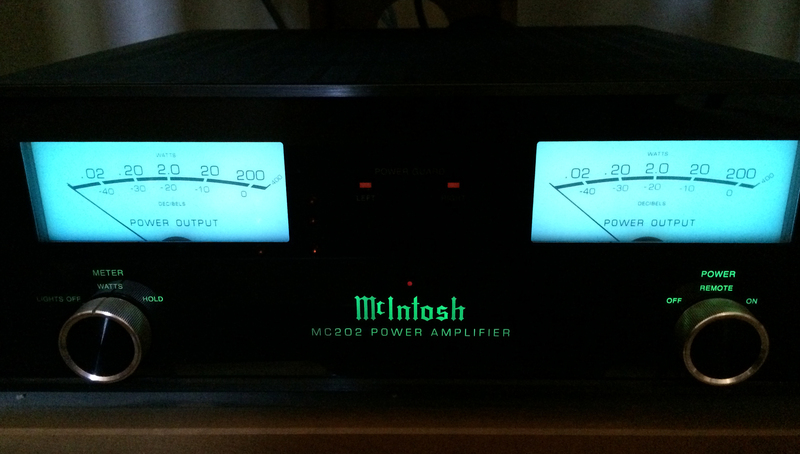 There was one exception to that last statement, and that involves my first McIntosh purchase of $299 – the MR-67 FM tuner. When I brought it home to my parent’s house that December of 1963, I owned virtually nothing else – not even an audio amplifier with which to play the tuner! I recall my parents just standing there, shaking their heads, as the crazy son excitedly unboxed his beautiful Mac tuner that first evening: Much water has passed under the bridge since that time, and I hope I have been able to convey, in this post, the nature and excitement of those earlier, gentler times, and why saying goodbye to this particular possession will be difficult. Maybe nobody will match the auction’s starting bid, and it will not sell, after all! Note: As always, I have no special connection with or financial interest in any product or company featured or “endorsed” in my blog posts! This entry was posted in General History, Human Nature, Music, Relections on Life, Technology and tagged audio, B&W speakers, E-bay, Fisher, FM stereo tuner, Frank McIntosh, H.H. Scott, Harman Kardon, Marantz, MC 202 amplifier, MC275, McIntosh, McIntosh Laboratory, MR 67, UE Boom by Alan. Bookmark the permalink.